“Jesus however answered him: The first of all the commandments is: ‘Hear O Israel, The Lord your God is one: and you must love the Lord your God with your whole heart, your whole soul, your whole mind and your whole strength’. This is the first commandment. The second is like it: ‘You shall love your neighbor as yourself.’ There is no greater commandment that this.” (Mk 12.29-31). The Servant of God, Mary Angeline Teresa McCrory, was a diligent woman, devoted to religion, remarkable for faith and full of charity. Extremely attentive to the needs of society, she was filled with faith even in adverse and hostile situations and she rendered credible witness to the defense of human life. She was a Sister totally on fire with the love of God and most kind toward the needy in whom she always saw the image of Christ. The Servant of God was born on January 21, 1893 in the town of Mountjoy in Ireland to an ordinary but Christian family animated by a very strong faith. She was baptized Brigid Theresa. In 1901, because of grave economic problems, the McCrory family had to move to the town of Clydesdale in Scotland. There the young girl was able to attend the Elmwood Convent School, an institute directed by the Franciscan Sisters of the Immaculate Conception of the Blessed Virgin Mary. In 1912, after the tragic death of her father, the young girl intensely desired to devote a part of her life to the sick and to show merciful care towards the aged. Therefore, she asked to be admitted into the Congregation of the Little Sisters of the Poor in Glasgow, a community originally from France. On September 8, 1913, she was professed, taking the name of Mary Angeline of Saint Agatha. In 1915 they senther to Brooklyn, New York, to Saint Augustine’s Home for the Aged to extend her ministry, where because of her humble self sacrifice and practical good sense she soon became an advisor to the superior. In April 1925, the Servant of God made her perpetual profession of the three vows as well as of a fourth proper to that Congregation, namely, that of hospitality. In October 1926, she was named Superior of the house “Our Lady’s Home” in New York, in which about 230 elderly people were being cared for with love and kindness by eighteen sisters. During her tenure, Mother Mary Angeline proposed certain changes which, however, were not accepted. In 1929 because of disagreements, the Servant of God together with six other sisters decided to leave in order to carry on their charitable ministry elsewhere. This anguishing and difficult decision was done in consultation and with the approval of the Diocesan Church Authority which thought that her proposal more adequately met local needs. Mother Mary Angeline, having obtained the appropriate indult of the Apostolic See, founded the Congregation of the Carmelite Sisters for the Aged and Infirm affiliated with the Order of the Blessed Virgin Mary of Mount Carmel. The great economic depression which at that time was plaguing the United States of America and reduced thousands upon thousands to misery and poverty did not restrain the passionate fervor of the Servant of God but indeed offered an opportunity for founding a ministry better suited to meet needs which in those years seemed most urgent. Because of this, several guest homes were opened in a short time and the new institute greatly improved previous practices of caring for the aged so that they were attended not only medically, psychologically and spiritually but also with due regard for their social needs. Mother Mary Angeline was responsible not only for the administration of the houses but especially for the establishment of the new Congregation. Moreover, she never neglected the human and spiritual growth of her Sisters but always preserved in them the unity of action and contemplation. She served several times as Superior of the new Congregation, but in 1978, because of ill health she declined re-election, although she was recognized by all as Foundress and Mother General Emerita. Her spiritual journey was marked by a marvelous luster. She was a woman of unshaken hope, great humility and singular clarity of purpose and action. An extremely strong prayer lifesustained a generous ministry and governed her daily decisions. In her final years, her tranquil acceptance without question of physical pain and infirmity bound her to the mystery of the Cross. 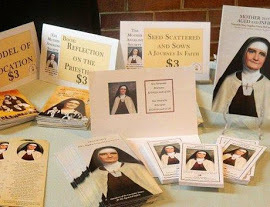 Stricken with weakness she confidently placed herself into the hands of the Lord in the Motherhouse in Germantown, New York, where she died piously on January 21, 1984. An investigation into her reputation for sanctity was held in the United States at the Albany Diocesan Chancery from August 15, 1992 to April 13, 2007. By its decree of June 27, 2008, this Congregation for the Causes of Saints approved the Diocesan investigation as juridically valid. When the Positio was submitted, a discussion followed according to the norms of Canon Law as to whether or not the Servant of God had lived the virtues to a heroic degree. To this end, a Special Meeting of Theological Consultors was held on March 4, 2011. The Cardinals and Bishops convened in Ordinary Session presided over by me, Cardinal Angelo Amato, on April 17, 2012. They recognized that the Servant of God had cultivated the theological virtues and the associated cardinal virtues. Finally, the Supreme Pontiff Benedict XVI was informed of all these facts through an accurate report of the undersigned Cardinal Prefect. His Holiness accepts the decision of the Congregation for the Causes of the Saints and considers it definitive. Today he declared it established both in fact and for the purpose of this decree that the Servant of God Mary Angeline Teresa practiced to a heroic degree the theological virtues of Faith, Hope and Charity towards both God and neighbor as well as the cardinal virtues of Prudence, Justice, Temperance and Fortitude. The Supreme Pontiff has ordered that this decree be published and placed in the acts of the Congregation of the Causes of the Saints. Given in Rome, June 28, 2012 A.D.